Temur, grandson of the Great Khan, is walking away from a battlefield where he was left for dead. All around lie the fallen armies of his cousin and his brother, who made war to rule the Khaganate. Temur is now the legitimate heir by blood to his grandfather’s throne, but he is not the strongest. Going into exile is the only way to survive his ruthless cousin. Once-Princess Samarkar is climbing the thousand steps of the Citadel of the Wizards of Tsarepheth. She was heir to the Rasan Empire until her father got a son on a new wife. Then she was sent to be the wife of a Prince in Song, but that marriage ended in battle and blood. Now she has renounced her worldly power to seek the magical power of the wizards. These two will come together to stand against the hidden cult that has so carefully brought all the empires of the Celadon Highway to strife and civil war through guile and deceit and sorcerous power. Elizabeth Bear. How does this author manage to do this to me every time? What a magnificent fantasy read Range of Ghosts turned out to be for me! I read it slowly because I wanted to savor every single detail on the pages, and I didn't want to miss a single word, nor did I want to lose track of her world building. What made it so absorbing? The way she weaves the story, of course, plus the world building which is based on both Middle Eastern and Asian cultures, and the characters that inhabit that world, from heroes to villains. Bear takes the reader from the steppe plains on the land of the Eternal Sky where the Great Khan once ruled and where Qori Buqa waged a terrible war killing the rightful heir to the Khagnate and leaving young Temur to flee for his life, through the Range of Ghosts where blood ghosts raised by an evil wizard threaten his life. To the Rasan Empire and the Citadel of the Wizards of Tsarepheth where Temur meets the strong and beautiful Once-Princess and now wizard Samarkar. And to the great Ala-Din stone in the Uthman Caliphate, a land of veiled women where assassins, a djinn and an evil wizard's magic drive our heroes on to the White Sea. There is war and love, life and death, evil and magic. There is a sense that fables come to life as our hero and heroine(s) race through danger. Magic takes a toll, debts must be paid, and while villains do damage, they don't win all the battles. The hero is young, uncertain and just beginning to find his strength and will, yet females are strong and powerful in this tale of wizards and warriors. Oh, and horses are magnificent! I love the sense of wonder in our characters as they move from their own lands and witness the changing skies that Bear uses to define the different empires, and fully experience the differing cultures of this world. There's a contradictory sense to this story in that it can lull the reader with its beauty, yet the pace is quick with action. I chose to let it lull me this time instead of quickly gobbling up the action. Bear ends this first installment at just the right moment satisfying the reader, but leaving the road open with a big 'danger ahead' sign that promises further adventures. Of all the books I've read by Bear to date, this is the one that gets closest to what I think of as a traditional fantasy story -- that's not a bad thing... just rather surprising. I also find it interesting that this is the second series I've read where Bear begins with her hero/heroine at the end of an epic battle and where a horse comes to his/her rescue. The other story is All The Windwracked Stars. On the minus side, the first few sentences in this book worried me as they are a bit overdone! Don't let that put you off because thankfully that only lasts for a few sentences and Bear's story telling abilities quickly take over. 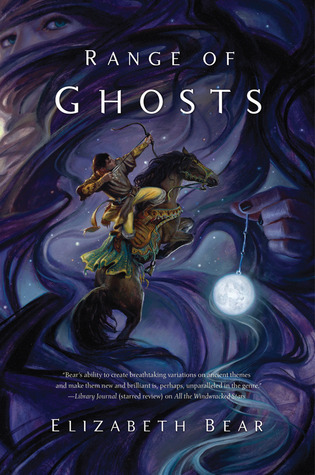 Range of Ghosts by Elizabeth Bear is a beautiful fantasy read and a great beginning to the Eternal Sky series. If you love fantasy, I thoroughly recommend it. Glad you enjoyed it so much Hils! :) I was thinking of picking this up, but now that I'm reading your review, I'm thinking there's more "history," and Asian influences than I thought at first. Hmmm, what to do, what to do. Perhaps I'll wait for more books to be released... do you know how many books the author has planned? PS: I believe this is a trilogy.